Shear forces are one of the most widely used methods to order and align soft crystals. Small-angle x-ray and neutron scattering experiments revealed for the first time the detailed structure of soft crystals. In particular, such crystals exhibit Bragg-peaks that were difficult to index assuming homogeneous crystal structures. Their origin had been attributed to changes in the crystal structure that are induced by the shearing process. We demonstrate that these Bragg-peaks are an inherent property of soft crystals related to the finite coherence of their crystalline lattice. Their consideration allows a detailed and quantitative analysis of the diffraction patterns of seemingly unrelated materials such as lyotropic liquid crystalline phases, mesoporous materials, colloidal dispersions, block copolymers, electro-rheological fluids, and photonic crystals. It further enables to develop a concise picture of order, line-density, field-induced orientation and epitaxial relations for soft material lattices. Intuitively, one relates the term soft to mechanical properties of a material such as its elasticity or compliance. Typical soft materials are plastics, gels or cremes. On a molecular scale these properties are related to relatively weak interaction potentials having a weak or soft spatial dependence. Soft materials can spontaneously order thereby to some degree tolerating imperfections such as deviation in size and shape of its constituent structures. Another very useful property is their large susceptibility to external fields. This means that already modest external fields are able to strongly induce a macroscopic alignment in a particular direction. These properties are commonly exploited in modern material science to generate highly ordered solid state materials by templating highly ordered soft structures. Scattering techniques such as small-angle x-ray and neutron scattering are one of the most powerful experimental tools in soft condensed matter. Since first experiments twenty years ago is was nnoted that soft materials that had been ordered and aligned in external fields exhibited Bragg-peaks that could not be indexed assuming a single homogeneous crystal structure. Their origin was attributed to changes in the crystal structure induced by the application of the external field. Such structural defects comprise changes in layer stackings, phase coexistence, twinning, unit cell distortions, specific multi-grain arrangements or multiple diffraction. Field-induced structural defects would seriously prohibit the use of such methods to generate ordered soft materials for applications where homogeneous order and orientation are critical such as in the preparation of photonic crystals or of nanostructured magnetic or semiconducting materials. Figure 1 Evolution of Debye-Scherrer rings a, into Bragg-peaks d upon increasing the orientational and translational order of an fcc-lattice with unit cell dimension of a = 42.5 nm (a: lt = 0.1 nm [mm]\rightarrow[/mm] b: lt = 30 nm [mm]\rightarrow[/mm] c: lt = 80nm [mm]\rightarrow[/mm] d: lt = 150 nm). At intermediate states of order (b, c) the diffraction patterns show a large number of allowed and quasi-forbidden Bragg-peaks. In our experiments we show that such unexpected, quasi-forbidden Bragg-peaks are characteristic for ordered homogeneous, macroscopically oriented soft materials. Their origin is related to the softness of the interaction potential, which on the one hand allows spontaneous ordering by tolerating imperfections of the constituent structures, but on the other hand also tolerates imperfections that limit the coherence of the crystalline lattice. This is shown by a combination of scattering experiments (neutron and synchrotron x-ray diffraction), direct imaging (scanning electron microscopy), and model calculations. It explains the presence of quasi-forbidden Bragg-peaks in seemingly unrelated materials such as lyotropic liquid crystalline phases, mesoporous materials, colloidal dispersions, block copolymers, electrorheological fluids, and photonic crystals since these materials are either soft or have been prepared from soft material precursors. We further show that a consistent picture of line density, field-induced orientation, and epitaxial relations can be developed for the first time by the consideration of quasi-forbidden Bragg-peaks. The effect of finite lattice coherence on the diffraction patterns can be investigated by model calculations (Fig. 1). They allow to adress the fundamental question of how Debye-Scherrer rings transform into Bragg-peaks if an originally isotropic multi-domain structure is oriented in a particular direction. Intuitively, one would expect Debye-Scherrer rings that correspond to (hkl)-lattice planes which are forbidden in this direction to gradually disappear, whereas Debye-Scherrer rings that correspond to (hkl)-lattice planes that are allowed to gradually develop Bragg-peaks. Eventually, all Debye-Scherrer rings would disappear and only allowed Bragg-peaks would remain. The calculations show, however, that there exists a broad intermediate state, where all Debye-Scherrer rings – even those that correspond to forbidden (hkl)-lattice planes – develop Bragg-peaks. Eventually, at higher orientations the Bragg-peaks that belong to forbidden (hkl)-lattice planes loose intensity and disappear. Figure 2 a, Ewald plane construction to illustrate the origin of quasi-forbidden Bragg-peaks. The incoming beam direction n is parallel to the b*-axis of the reciprocal unit cell. All reciprocal lattice points (green) located on the (a*,c*)-plane (Ewald-plane) fulfill the Bragg-condition and lead to allowed Bragg-peaks. All other reciprocal lattice points (red) do not fulfill the Bragg-condition, but can lead to quasi-forbidden Bragg-peaks if their peak width is of the order of the distance d to the Ewald plane. b, Schematic model of a mosaic-like assembly of tilted crystalline domains with phase-destroying defects at their boundaries. The finite dimension and angular tilt of the domains leads to a finite coherence resulting in broadening of the Bragg-peaks. The proposed model is in good agreement with the SEM-images in Fig. 3. 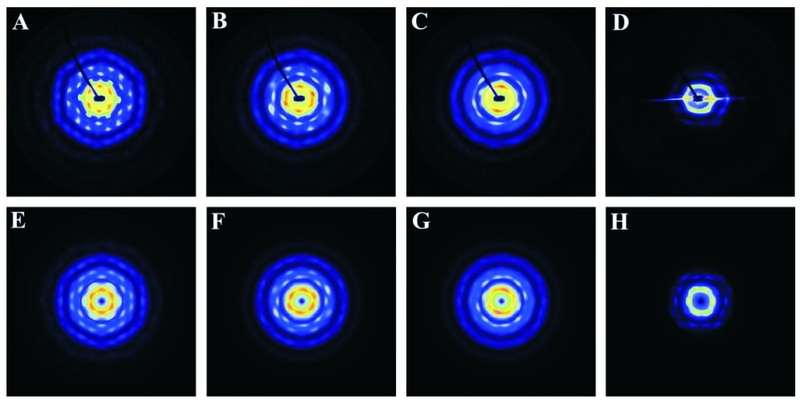 Figure 3 SEM-images of a fcc mesoporous silica replica, that has been investigated by rotating single crystal synchrotron SAXS. The most abundant netplane surfaces (100, 110, 111) are shown in a and b. a shows the characteristic terraces of the (111) netplane surfaces. Arrows are drawn to indicate individual domains and orientational deviations (a), as well as bending of lattice planes within large individual domains (c). Deviations from the macroscopic orientation by a few degrees are already sufficient to cause secondary Bragg-peaks. The origin of the quasi-forbidden Bragg-peaks can be explained by using the Ewald sphere construction. For a particular Bragg-peak the observed peak intensity depends on the peak position and the peak width relative to the Ewald sphere, which for small-angle diffraction can be well approximated by a plane such as shown in Fig. 2. All reciprocal lattice points that are located on this plane fulfill the Bragg-condition and give rise to allowed Bragg-peaks. All other reciprocal lattice points located at distances <em>d away from the plane do not fulfill the Bragg condition. If, however, the peak width δ of the peaks related to these lattice points are of the order of the distance d, then these reciprocal lattice points will (partly) fulfill the Bragg-condition leading to quasi-forbidden Bragg peaks. With increasing order and decreasing peak width, these Bragg-peaks will decrease in intensity and will eventually disappear, as seen in Fig. 1. To investigate the lattice structure of oriented soft materials in more detail with respect to defects that limit the lattice coherence, we performed shear alignment experiments on a prototype soft material, a lyotropic liquid crystalline fcc-phase formed by block copolymer micelles. The aligned samples were templated by a sol-gel process to obtain mesoporous silica crystals that are exact replica of the lyotropic phase structures. These replica were investigated by determined by rotating crystal synchrotron SAXS and scanning electron microscopy (SEM). The alignment experiments were performed using a Bohlin CVO rheometer with a Searle-type cell at the small-angle neutron scattering instrument D11 at ILL, Grenoble. The SEM-images in Fig. 3 clearly show the occurrence of grain boundaries and lattice plane tilts that limit the lattice coherence. Figure 4 Measured diffraction patterns (A - D) at degrees of rotation, which correspond to lowest index projections, i.e. at α = 0° (A),  at α = 39° (B),  at α = 59° (C), and  at α = 90° (D) together with model calculations (E – H). They show that the sample is a homogeneous, single crystalline fcc replica of the lyotropic phase. The silica replica was then placed on a goniometer stage in the beamline BW4 at HASYLAB/DESY for a full crystallographic characterization. The sample was rotated by 180° around its vertical axis and diffraction patterns were recorded at each degree of rotation. Measured diffraction patterns at degrees of rotation which correspond to lowest index projections, i.e. at α = 0°,  at α = 39°,  at α = 59°, and  at α = 90° together with model calculations are shown in Fig. 4. We observe that at each degree of rotation the model calculations are in nearly quantitative agreement with the experiment and account correctly for the position and relative intensity of all reflections, also for higher-indexed projections such as  where nearly all observed peaks are secondary Bragg-peaks. The neutron-, x-ray, and SEM-experiments demonstrate that soft materials do not represent a particularly low state of order. The orientational order parameter calculated from the mean deviation angle of the lattice planes (9°) has a value of S = 0.95 . Rather, the order is not perfect enough to suppress secondary Bragg-peaks in diffraction experiments, which are sensitive to minor alterations in the periodicity of crystal lattice planes. Financial support of the DFG-Graduiertenkolleg GK611 is gratefully acknowledged. De Gennes, P. G. Soft matter: more than words. Soft Matter 1, 16 (2005). Hamley, I.W., Introduction to Soft Matter, Polymers, Colloids, Amphiphiles and Liquid Crystals (Wiley, Chichester, 2000). Buitenhuis, J. & Förster, S. Block copolymer micelles: Viscoelasticity and interaction of soft spheres J. Chem. Phys. 107, 262-272 (1997). Ackerson,B. J., Hayter, J. B., Clark, N. A. & Cotter, L. Neutron scattering from charge stabilized suspensions undergoing shear. J. Chem. Phys. 84, 2344-2349 (1986). Förster, S., Timmann, A., Konrad, M., Schellbach, C., Meyer, A.,Funari, S. S., Mulvaney, P. & Knott, R. Scattering curves of ordered mesoscopic materials. J. Phys. Chem. B 109, 1347-1360 (2005). Lindner, P., & Zemb, Th., Neutrons, X-rays and Light: Scattering Methods Applied to Soft Condensed Matter. (Elsevier, Amsterdam, 2002).